Sri Joydip was born in 1975, to a Middle Class family in Bengal. When he was very young, he was often silent, and would get into trance state without apparent knowledge of it. In 1995, Sri Joydip first visited Shivlinga Mountain at Garwal Himalayas while in a trekking camp for Thelu and Koteswar. He had a very powerful spiritual experience, while staying alone in the base camp in front of Shivlinga Mountain for ten days, while his other camp participants moved into Camp one. He completed Graduation in 1997, from Burdwan University and pursued a Technical Degree in Software Engineering from National Institute of Information Technology. He provided service for 1 year, in 2 software training companies and finally opened his own IT company. He, then studied Management from Indian Institute of Management, Kolkata . After completing his studies there he was invited to teach management courses on entrepreneurship and business planning in the prestigious Indian Institute of Management, Kolkata as a guest faculty to PGP students of IIMC from 2004-2007. Later in 2009, he started his own management consulting company, writing business plans for companies across the world. Hearing the Divine Calling from Arunachala Shiva in 2009, Sri Joydip met his Guru-Arunachala Shiva and founded Sri Joydip Ashram. He began teachings on the Bhagvad Gita and its application in Management from 2010-2011. Later, he stayed for a long period in Tiruvannamalai and practiced Sadhana in Dakshinamurty Temple and ‘A powerful Yoga’ was born. This yoga was called “Surya Yoga” and became the centerpiece of Sri Joydip Ashram courses. Sri Joydip also started teaching more advanced scriptures like “Shiva Sutras” and “Ribhu Gita” and toured across countries teaching Bhagvad Gita, and its application to masses in 2011. Sri Joydip started spreading insight and wisdom on different issues of global importance. He brought a unique wisdom tradition to understanding deeper spiritual truths and their application to life. From then on, he started initiating disciples in Surya Yoga, which was revealed by Adi Guru Lord Dakshinamurti, while meditating in Tiruvannamalai. He also conducted a television program on spirituality and its practical application while teaching Surya Yoga in April 2012. In May/June of that year, he also produced a television program on ETV called “The Art of Stress Management by Surya Yoga”. From 2015 , onwards Sri Joydip focussed more on writing to spread his vision of spirituality which is unique in its own way. He completed an Intructor Led English creative writing course from British Council . He further pursued an online course from Open university on creative writing. 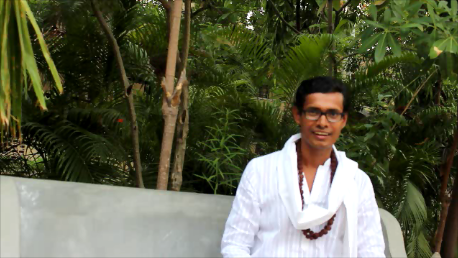 In May 2015 , Sri Joydip started writing for Zenward publication , a globally reputed Yoga publication house under Mindvalley corporation. In July 2015 , he started writing research report for a film on ” Life of a Sage”. In end of the year he also wrote the script and research report of spiritual visionaries across last ten thousand years , which is named as “Indian Sages”. Overall he has written 7 books in Spirituality and its application in management and life, along with numerous articles in reputed journals, blogs and internet forums. Sri Joydip has also made 10 spiritual films and 2 of them, “Yoga as Medicine” and “Yoga for Wellness”, were selected for the Kolkata Film Festival in 2010 and 2013.